The world is on the brink of destruction and I have all my preps together; my water, food, fire making gear, guns and ammo, 3 different combat knives, 5 typesof camo, water filters, night vision goggles, camping gear, a bug out vehicle, a bug out location and a plan. I also have 20 pounds of baking soda. Yes, baking soda. After the balloon goes up, off grid, in the post apocalypse zombie filled world there are tons of uses for baking soda. Baking soda, or sodium bicarbonate, helps regulate pH, keeping a substance not too acidic or too alkaline. When baking soda comes in contact with either an acidic or an alkaline substance, it’s natural effect is to neutralize that pH. It releases bubbles of carbon dioxide when it interacts with an acid and a liquid. Beyond that, baking soda has the ability to retard further changes in the pH balance, known as buffering. This capability of neutralizing and buffering allows baking soda to do things such as neutralize acidic odors. It’s most commonly used in baking, where it acts as a leavening agent. If your wife is like mine, there is always an open box of baking soda in the refrigerator to soak up odors. I’m an old coot and have a bit of acid reflux. After the mutant zombies bikers trash all the drug stores looking for drugs I doubt I will be able to get the prescription medicine I take to ease heartburn. I doubt I will even be able to find a pack of Tums or Rolaids. Baking soda is a safe and effective antacid to relieve heartburn, sour stomach and/or acid indigestion. It’s an old remedy that was used for centuries before Tums and Rolaids came on the market. Acid reflux runs in our family and my grandfather took a small spoon of baking soda in a glass of water after every meal to keep acid stomach at bay. He died at 105 back in 1957 but I still remember him mixing it up at the table. I can’t say that baking soda helped him live that long but it did make him a lot less grumpy. It also works great as a tooth paste. You can use it alone or make a paste from baking soda and a 3 percent hydrogen peroxide solution that can be used as an alternative to commercial non-fluoride toothpastes. Then there is your breath. Hey guys, if we want to have any “companionship” after we get to the BOL you need fresh breath. At least that’s what they say in the commercials. Put one teaspoon baking soda in half a glass of water, swish, spit and rinse. Odors are neutralized, not just covered up; it also helps to reduce periodontal disease. Dentists are going to be hard to come by in an off grid world. It will pay to keep your teeth and gums in good shape. Remember, I’m old. For those of you like me, you can soak dental appliances, like dentures and bridges, in a solution of 2 teaspoons baking soda dissolved in a glass or small bowl of warm water. The baking soda loosens food particles and neutralizes odors to keep appliances fresh. You can also brush appliances cleanusing baking soda. One of the things many of the writers of the 17th, 18th and early 19th century mentioned in their writing was the way people smelled back then. In one word, Bad! After the stink (pun intended,) hits the fan, and you are running for your life, baths may be hard to come by. I plan to bug out with a small group and I’d prefer the bad guys not be able to track us by the smell. Add a bit of baking soda in that bucket of water you use to wash the BO off, and you will find that you stay stink-free longer, without a tell-tale floral fragrance you might get from soap, that could tip off your location to the FEMA guys. In the old West at many saloons a traveler could buy a token for, as they put it , “Bath, Beans and a Screw” for five bucks. For an extra dollar you got to be the first to use the bath water. If you can get a bath, add 1/2 cup of baking soda to your bath to neutralize acids on the skin and help wash away oil and perspiration. A little baking soda really helps when half a dozen folks are sharing the same bath water. Yes I know you can wash in a lake, but what if it is winter and you live in Michigan? If you are smart you are going to heat enough water for your group to bathe in, and share. That is how they did it in the old days. 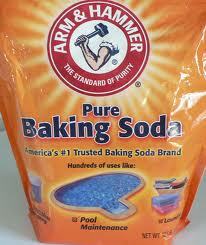 After your bath, pat some baking soda onto your underarms to neutralize body odor. Put a dash in your shorts to prevent chaffing, reduce odor and keep those delicate areas dry. Nothing worse than a case of crotch rot when you are on a cross country hike. Don’t forget to add a liberal amount of baking soda to your boots. It will keep your feet drier, better smelling and help prevent blisters. Trench foot is no fun and it could cost you your life. There is not much that baking soda can un-stink. You can use it when you wash cloths, scrub down counters after you butcher a hog or to clean out the car you just spent 6 days and nights in bugging out. To soothe your feet after a hard day of hiking through the bush, and running from bad guys, dissolve 3 tablespoons of baking soda in a tub of warm water and soak your feet. There is sure to be a lot of dirty work, chopping wood, digging latrines and working on vehicles. Before you head in for lunch use some baking soda as a hand cleaner. It will gently scrub away ground-in dirt and neutralize odors on your hands. Baking soda can be used to neutralize battery acid corrosion on cars, generators, etc. because it’s a mild alkali. (Be sure to disconnect the battery terminals before cleaning.) Make a paste of 3 parts baking soda to 1 part water, apply with a damp cloth to scrub corrosion from the battery terminal. After cleaning and re-connecting the terminals, wipe them with petroleum jelly to prevent future corrosion. Our bug out location has a septic tank. Regular use of baking soda can help keep it flowing freely. 1 cup of baking soda per week will help maintain a favorable pH in your septic tank. You can extinguish fires with baking soda. It can help in the initial handling of minor grease or electrical fires, because when baking soda is heated, it gives off carbon dioxide, which helps to smother the flames. For small cooking fires (frying pans, broilers, ovens, grills), Stand back and throw handfuls of baking soda at the base of the flame to help put out the fire. Scatter baking soda around the garden to prevent rabbits from eating your veggies. After your local WalMart has been looted, you will have to make the clothes you have last a long time. You want them to look as good as you can. For stubborn stains, try soaking overnight in the baking soda solution and detergent or scrubbing with baking soda on a damp sponge. First and foremost, come the end of civilization you better not mess with my coffee. You can eliminate bitter after tastes in coffee pots using a solution of 1/4 cup baking soda in 1 quart of warm water. Baking soda is the food safe way to clean dirt and residue off fresh fruit and vegetables. Just sprinkle a little on a clean damp sponge, scrub and rinse. When dipping a chicken, to get the feathers off add a teaspoon of baking soda to the boiling water. Feathers will come off easier, and the flesh will be clean and white. In the camp kitchen, soak dried beans in a baking soda solution to make them more digestible. Remove the fishy smell from your fillets by soaking the raw fish in a baking soda solution for an hour inside a cooler before you cook it. Don’t forget you can still use it as a leavening agent when making bread. After the meal make a thick paste of baking soda and water, and used it to scrub enameled cast iron a nd stainless steel cookware. Remove burned-on food from a pan by soaking it in a baking soda solution for 10 minutes before washing. You can treat insect bites and itchy skin with baking soda. For insect bites, make a paste out of baking soda and water, and apply as a salve onto affected skin. To ease the itch, shake some baking soda into your hand and rub it into damp skin. It even makes a fairly good cleaner for wounds, but it will sting a bit. Apply it on rashes, and poison ivy irritations. The group medic can use baking soda to unblock a stuffy nose by adding a teaspoon of baking soda to a pot of boiling water and having the patient inhale the vapors. Do you have very small children? After the world as we know it ends you will have to go back to cloth diapers. Baby skin requires the most gentle of cleansers. Dissolve ½ cup of baking soda in 2 quarts of water and soak diapers thoroughly. A little baking soda in a diaper at night can reduce ammonia smell and the rash it causes. After the fact, you can put two tablespoons in your baby’s bathwater to help treat diaper rash. Are your kids the 4 legged kind? You can use baking soda to deodorize pet bedding and deodorize the cat boxes. Cover the bottom of the litter box with baking soda, then fill as usual with litter. To freshen between changes, sprinkle baking soda on top of the litter after a thorough cleaning. Eliminate odors from your pets bedding by sprinkling liberally with baking soda, wait 15 minutes (or longer for stronger odors), then take them outside and beat them like you would a rug. You don’t want the pets stinking up the cabin? Give them a bath using baking soda. It’s good for their hair and skin and does a great job of getting rid of that wet dog smell. By the way, this baking soda bath works fairly well after skunk attacks, for humans and animals alike. There you have it. Survival is not always about guns, ammo and cool gear. Our ancestors did not just survive they lived this way and moved forward to make the world what it is today. No matter how much you store you will have to go back to the basics at some point if you want to go on living. Stored stocks can only last so long. Baking soda has been a fixture in many wilderness home for a long time. Our forefathers and mothers used it for a reason, it works and it does many jobs. Don’t forget to include it in your storage.